KastKing Royale Legend is the Best Baitcasting Reel Under 50. The KastKing Royale Legend comes with many premium features for an affordable price. The baitcasting design allows for smooth casting and reeling that is also super silent. Additionally, this reel is packed with components for superior control and high-performance drag. Even though the KastKing Royale Legend Fishing Reel comes loaded with features, the whiffle-style body maintains a lightweight despite its strength. The Royale Legend reel is perfect for use in tournaments. The outstanding specs paired with versatile features make this tool easy to fish in all sorts of conditions. If you’re looking to catch different types of fish or to try out various fishing techniques, this is the reel for you. You will receive a sturdy baitcasting reel ready for use. The reel is neatly packaged with protective padding and shipping is quick. There is a very little risk for damage during shipping, so your reel will arrive in peak condition. In addition to the reel itself, the package includes a user guide to help those new to baitcasting. The guide will help you make any necessary adjustments to your reel in order to better suit your preferences. In case you are worried that you might be missing parts, the box also contains a parts list so that you can double check that you have received everything. Now, let us take a cloose look at its performance and features. The KastKing Royale Legend Fishing Reel is a baitcasting reel that is useful in a wide variety of situations. It holds up to large fish like trout and bass, as well as to harsh conditions like kayak fishing or ice fishing. The Royale Legend can be used for both fresh and saltwater fishing. The reel is extremely versatile and a great addition to your fishing toolkit. All the components are designed for longevity, so there is no need to worry about it seizing up. This reel comes with a 4-disc, carbon fiber drag system which is packed full of power. The system provides up to 17.5 pounds of drag, which makes the Royale Legend a true high-performance reel. The corrosion resistant ball bearings mean that the drag system will retain its smoothness for many fishing trips to come. The drag system also consists of a precision cut grass gear structure. The components are crafted with exceptional attention to detail out of durable materials so that your drag system is low maintenance and you don’t have to worry about it seizing. The KastKing Royale Legend Reel employs 11 shielded MaxiDur ball bearings, which are corrosion resistant so that you have the smoothest fishing experience possible. These 11 bearings plus 1 anti-reverse bearing yield super easy casting and reeling that will last. This baitcasting reel features dual magnetic brakes to give you even more control over your casting and to remove chances of backlash. The brake system is also easy to adjust to your needs. If your fishing situation changes quickly, you can fine-tune your reel to match. The reel also contains a ceramic line guide which allows for high-speed line performance. The spool is compatible with both monofilament and braided lines, so there is no need for you to purchase new line in order to use the KastKing Royal Legend Fishing Reel. This reel has exceptional build quality, especially for the price. The body is made of anodized aluminum which has been cross-drilled and CNC machined for optimal durability. This outer casing will resist corrosion, so the reel will keep looking new and polished despite repeated use. The MaxiDur ball bearings are also corrosion resistant so the reel will remain smooth over time. The carbon fiber drag system is made of high-quality materials, so it can withstand heavy usage while still delivering 17.5 pounds of power every time. The paint on the reel shows little signs of wear, even after prolonged fishing, which helps maintain the elegant look of the KastKing Royale Legend Fishing Reel. This KastKing reel, like many of the others, is exceptionally well designed. You can order the reel with a right or left-handed crank to suit your needs. The reel features a sleek, sophisticated design that will make it an excellent addition to any fishing gear collection. The handles are large and made of stainless steel, so they are durable and offer great control. The reel also comes with EVA padded foam grips which are non-slip, comfortable, and also help wick away any moisture that might settle on the handle. The whiffle-style spool makes the reel lighter than many similarly functioning products, without compromising the strength of the design. Without the extra weight, you can use this reel all day without worry of wrist fatigue. The KastKing Royale Legend Fishing Reel ships quickly and is backed by KastKing’s exceptional customer service. They reply quickly to any concerns raised and really strive to make sure customers love the experience. If your reel is defective, they will gladly send you a new one and work with you to solve any further problems. The company is easy to reach and highly responsive, so there is no need to worry if something is wrong with your reel. KastKing Royale Legend is the Best Baitcaster Under 50. The KastKing Royale Legend Fishing Reel is a great baitcasting reel for its price. It is extremely versatile and can be used for a multitude of fishing techniques like casting, pitching, and flipping. Though designed predominantly for freshwater, this reel can also perform in saltwater situations with the proper care. The reel is extremely durable with its MaxiDur corrosion resistant ball bearings, carbon fiber drag system, and anodized aluminum body. The magnetic dual brake system makes the KastKing Royale Legend unique in its price range. This feature helps offer exceptional control with customizability to suit your needs. 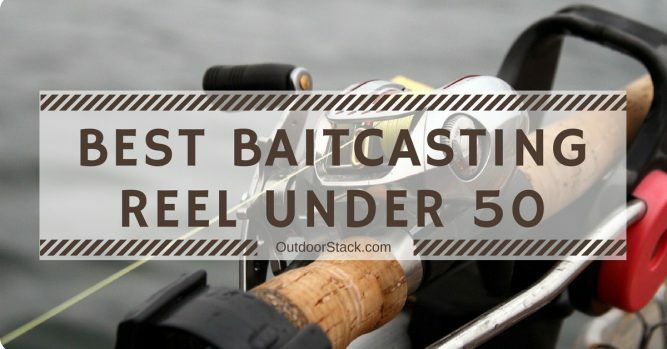 We hope you like our pick of Best Baitcasting Reel Under 50. KastKing Royale Legend is high on performance and style, making it a complete fishing package for a low price!